Justin Hartney corrected his trajectory just in time to avoid falling into the Middle Cove tide pools at Cape Arago. As he steadied himself on a bed of mussels, he gripped the camera dangling from his neck and locked eyes on his destination: a rock covered in elaborate gooseneck barnacles. Hartney is one of 19 students who took part in this summer’s Science & Memory program. It teaches students to use powerful multimedia storytelling techniques to turn the complicated science of climate change into compelling narratives meant to engage the public and encourage action. 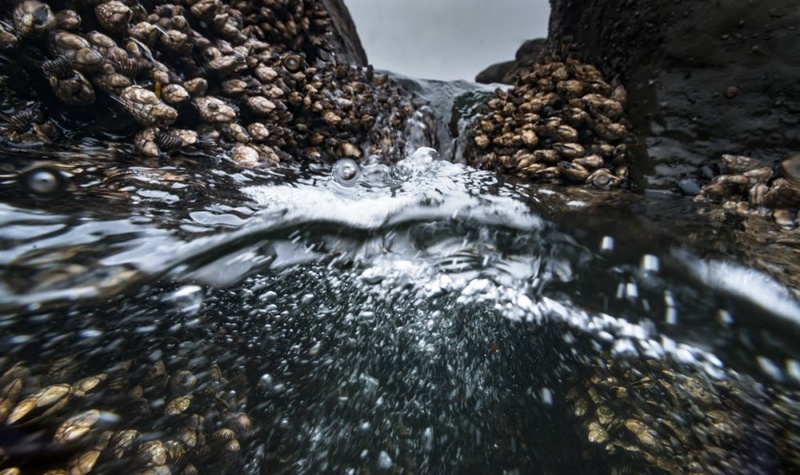 At the tide pools, Hartney was on a mission to tell the story of the photogenic goosenecks, whose formerly sturdy shells are being compromised by dropping pH levels in the Pacific Ocean. Telling that story with punch, he learned in Science & Memory, meant capturing an amazing image of the barnacles. Determined, he took another step, carefully avoiding the slippery kelp. Four years ago, SOJC faculty members Deborah Morrison, Dan Morrison, Torsten Kjellstrand and Mark Blaine realized that many were overlooking the effects of climate change in their own backyards, in part because the science can be complex. Recognizing the power of multimedia storytelling to help people understand research and drive them to act, the colleagues launched Science & Memory with a pilot trip to Cordova, Alaska. The results will soon be on display. Students are publishing their multimedia work over the next two weeks on the Science & Memory website, created by 2016 graduate Paige De Paepe. This spring, an exhibit of their work will be shown at the Charleston Marine Life Center, and the class will soon update its photo gallery on the third floor of Allen Hall, led by designer Anna Rath. 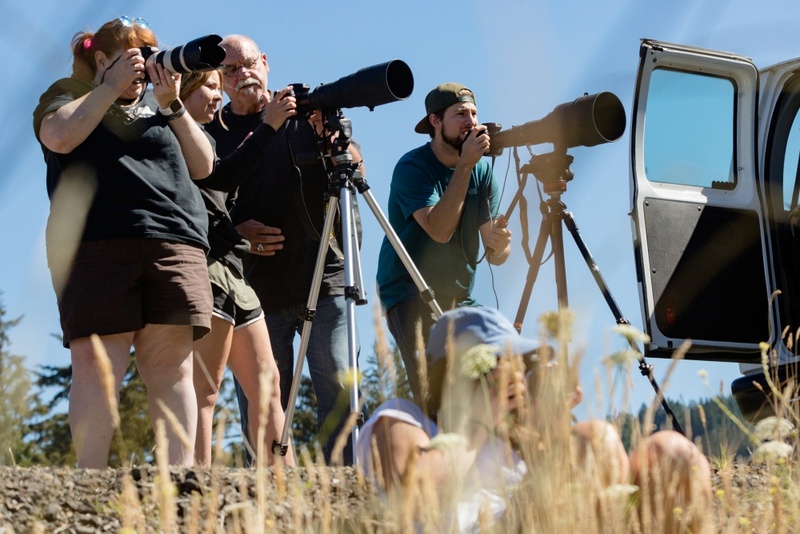 Each year, the experiential learning course begins during spring term with book assignments to build students’ background on climate change and reporting on scientific topics. As in past years, one of the hot topics for the 2017 class was salmon, a major indicator species of climate change. 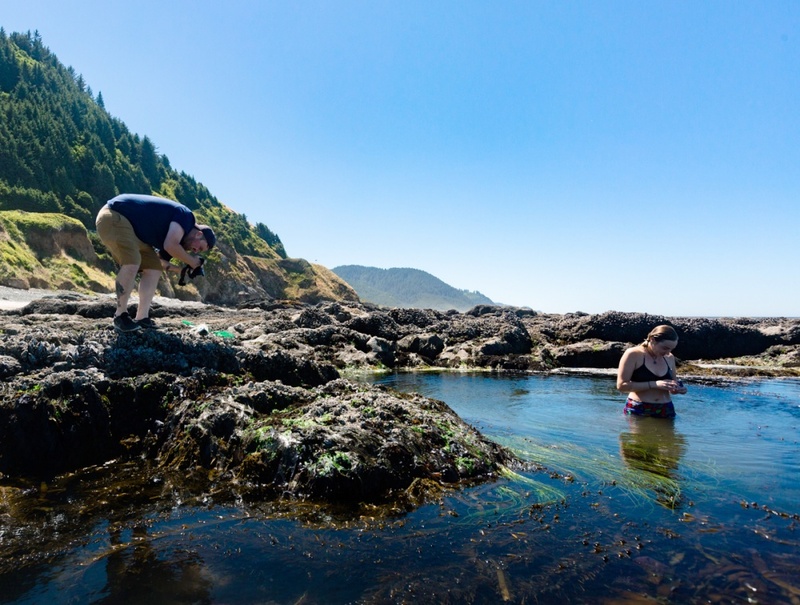 The course also focused on the sea star wasting epidemic, ocean acidification, species migration and other environmental changes happening on the Oregon Coast. 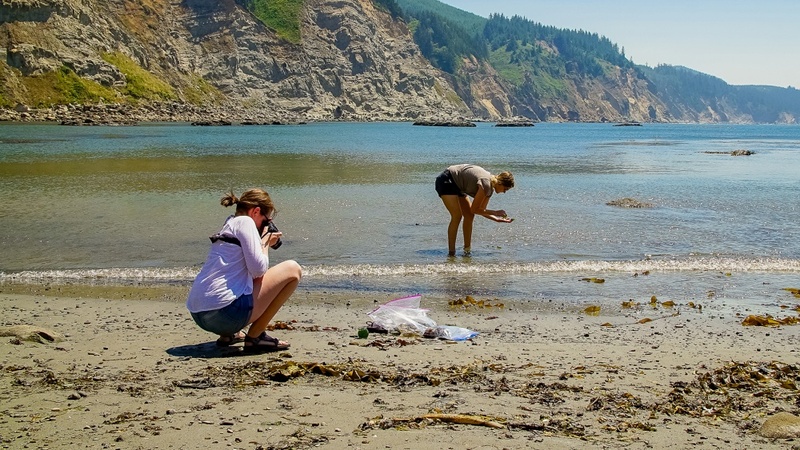 Class members selected several sites along the coast they felt were ideal for exploring this year’s theme, “Ocean, Estuary, River.” During camping trips throughout the summer, they visited Cape Arago, Sunset Bay and South Slough estuary in Charleston; Winchester Dam in Winchester; and Bob Creek in Florence — all of which lie within 43 degrees 17.58 minutes north latitude — to capture photos and video, collect data and gain inspiration. Not all of their work happened on the beach, however. 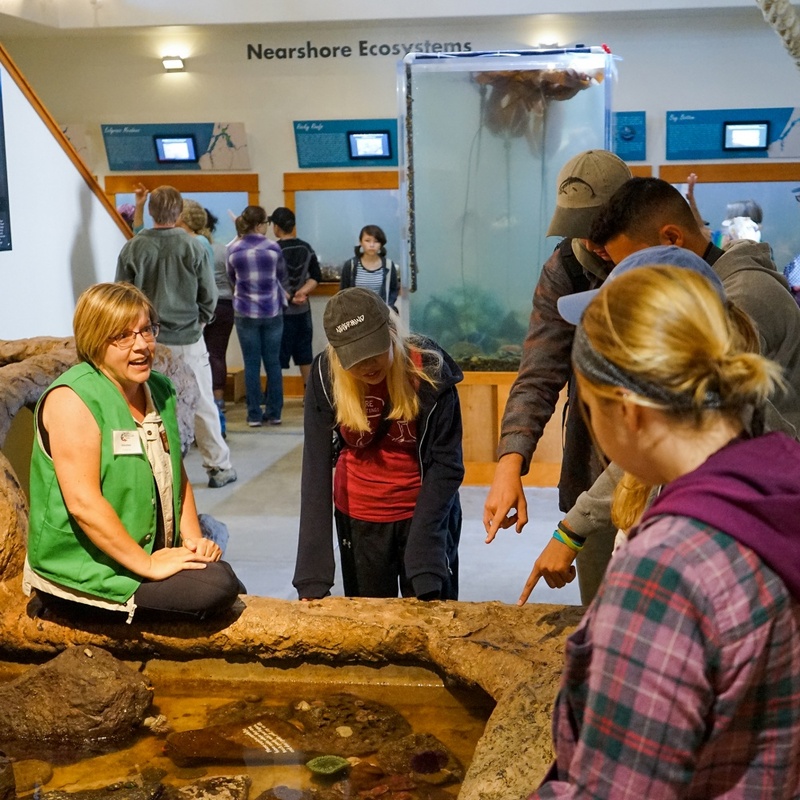 The class visited the Charleston Marine Life Center and Oregon Institute of Marine Biology, where they talked to experts to learn more about the science behind the stories they want to tell. Journalism and communication faculty members have been using the initiative as a jumping-off point for their own research as well. In addition to publishing articles in The Conversation and Quartz, faculty members recently presented a research paper on perceptions of climate change across ethnic groups at the 2017 Association for Education in Journalism and Mass Communication conference. Pam Cressall, a 2015 journalism graduate, has made the Science & Memory annual trip for the past three years. 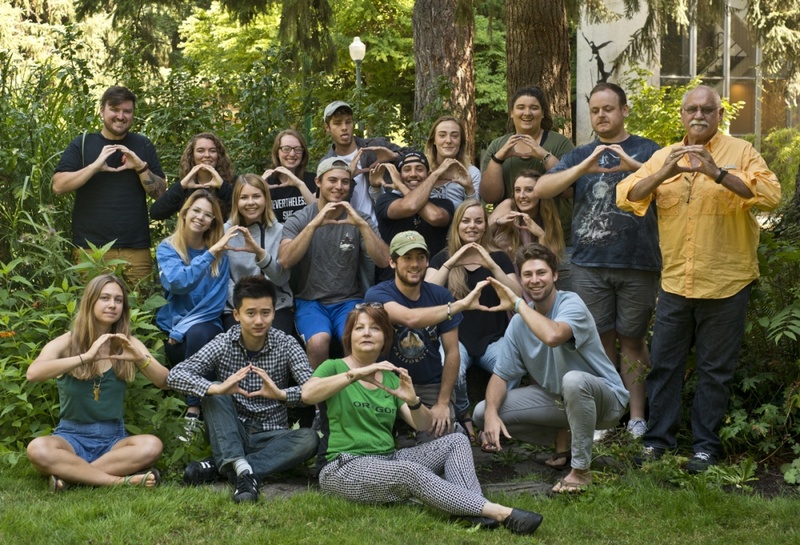 This year, Cressall compared the effects of climate change in Alaska and Oregon in a video compilation featuring clips of bears, octopuses, orcas and algae the students encountered in Cordova and Charleston. She found many connections between the seemingly dissimilar locales. Connection is a major theme for Science & Memory, which helps people understand how climate change affects them and the world around them. To convey a cohesive message, students use their individual strengths to publish content in a variety of media, including Adobe Spark data journalism stories, Tumblr blog posts, photos, video, artwork and social media posts. Many graduates of the program have launched careers, in part, on the strength of the portfolio pieces they produced for Science & Memory. For example, 2016 graduate Will Saunders, lead photographer for The Locals Project in Sisters, landed his first clients with his Science & Memory work. Also, advertising program alumna Taylor Richmond, a 2015 graduate, said her Science & Memory art helped her become a designer at Sparkloft Media in Portland. And Helen Torney and Monica Sagowitz, who worked together to create the Science & Memory logo, now work at Anomaly, a marketing and advertising agency in New York City. Sagowitz said the program allowed her to explore many of her interests and helped her zero in on a career path. The future is bright for Science & Memory too. The program is growing, and the faculty team hopes to expand the destinations it studies. Gates Coral Lab in Hawaii has already asked the project to visit and help increase awareness about coral bleaching, and faculty members are considering returning to the Oregon Coast and Alaska as well as traveling to Ghana.